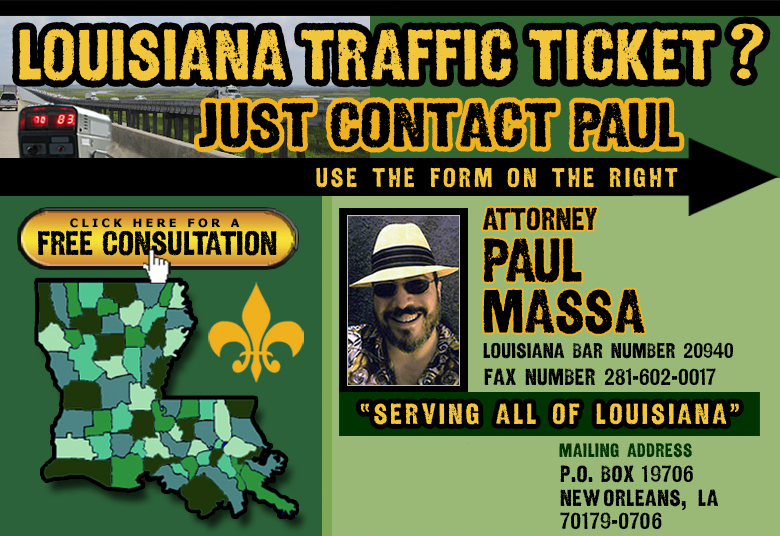 Put the legal experience of Louisiana Traffic Ticket Attorney Paul Massa to work for you. As an experienced Traffic Ticket Attorney since 1991, I represent clients throughout the State of Louisiana in all Parish District Courts, Municipalities, Cities, Towns and Villages no matter how large or small; from the large Metropolitan Traffic Courts in the big cities of New Orleans, Metairie, Kenner, Gretna, Houma, Baton Rouge, Layfayette, Lake Charles, Alexandria, Bossier City, New Iberia, Monroe and Shreveport down to the hamlets and villages out in the country or on the bayou throughout our beautiful state. It is Simple and Easy! NO RISK, and YOU HAVE NOTHING TO LOSE when submitting your information for my review and a free consultation. Since 1991, clients have been hiring me to represent them in their Louisiana traffic ticket cases. I help them avoid auto insurance premium increases, missed work, and travel expenses since they don’t have to go to court themselves. I go to court for them and obtain lower fines, court costs, and contempt fees in regards to their traffic ticket. My clients traffic tickets are either DISMISSED, or REDUCED to a NON MOVING VIOLATION which will not appear on the client’s driver license record. Words can not express my thanks and appreciation for your professionalism and service. With all of the many disappointments in our world today, it is comforting to know that professionals like you live up to your oath and provide a service that is top-notch. Thanks again for "making the traffic citation go away!" Thank you so much for all that you have done for me. I greatly appreciate your effort and your patience. I would certainly recommend you. Thank you Jesus! Thank you so much Mr. Paul! I really appreciate you always helping me and I always highly recommend people to contact you for service. Wow, thank you! I hope I behave myself and don't need your assistance, but I will recommend you to anyone having ticket issues. God bless you and thanks for telling me so soon. Thank you very much for the detailed reply -- I really appreciate your taking the time. Your name is in my records should anyone I know end up in the same predicament as I did! Thanks for everything Mr. Massa! You saved me so much money and time since I didn’t have to fly back just for this. Thanks so much again and I will absolutely refer you to others in case of any legal representation. You got my license reinstated! Thank you again! I can't thank you enough for your service Mr. Massa. I've received the reinstatement letter you mailed me and got my license reinstated! Thank you again! Mr Massa, Thank you very much for handling this matter for me. I really appreciate your professionalism - it's so refreshing to deal with someone who says exactly what he's going do, and then does it. You have my enduring gratitude. are always FREE with no obligation. Avoid Anxiety: When I represent you in Traffic Court, you won’t have to face the Judge, District Attorney, or Police Officer to argue your ticket alone. In fact, clients very rarely ever appear in Court when I have been retained their counsel. Avoid Aggravation: Driver’s License returned immediately, no courthouse hassles. Louisiana traffic tickets should not be taken lightly. They can ruin an otherwise good driving record and raise your car insurance rate for years. When ignored entirely, that can be grounds for an arrest during your next traffic stop; inconvenient and expensive to say the least. I prevent these avoidable consequences by representing clients in court to relieve them of these problems and the anxiety and aggravation that a day in Louisiana traffic court can be. Traffic ticket attorney Paul Massa provides high quality and affordable traffic ticket defense representation. Paul defends persons accused of all types of traffic offenses in courts throughout the State of Louisiana. Just fill out the free consultation form with your Louisiana Traffic or Speeding ticket information. Once I receive your information from the form I will quickly respond with an offer to represent based on your specific legal situation. If you hire me I do all the work and appear on your behalf. Its that simple. Louisiana traffic court procedures are quite unfamiliar to most people. Which is why it can be difficult for most motorists to make a persuasive presentation to the judge. Having an attorney or lawyer represent you can dramatically increase the chances of keeping your traffic ticket violation off your driving record and avoiding your appearance in court. Attorney Paul Massa knows the local court rules and has appeared before the court for many other clients for over 20 years. This now allows him to represent you in the most effective matter, for the most advantageous results possible. His traffic ticket defense experience will benefit you for years to come. If you are from out-of-state there may be no way you can make it back to Louisiana to contest your ticket. Rest assured, Paul Massa can handle your Louisiana speeding ticket case for you no matter what state in America you live in. If you have a Louisiana, traffic ticket, turn to traffic ticket attorney Paul Massa for a free consultation of your case. I offer my services throughout the State of Louisiana in all cities and Parishes. Dear Paul, I would love to meet you sometime. You are a profound credit to your profession! May you be blessed in all things at all times. You are the Man! You are truly Louisiana's finest! I was recommended by a former client of yours and will refer you as well in the future. Thanks a million! E.F.